I love coffee, period. My love of coffee stems from the opportunity to spend time in local breakfast restaurants when I was young with my dad, grandfather, and several crotchety men who would solve the world’s problems in an hour if anyone would take their advice. (See “History Repeating” below.) Throughout my high school and college years my love of coffee grew until I was drinking three pots a day in my mid-twenties. By this time, I started thinking more about quality than quantity and started exploring. I tried ‘gourmet’ grocery store coffee, coffee from a popular doughnut chain (known especially for their ‘dunk’-ability), and finally mail-order. Why Do Americans Drink Weak Coffee? I drink a LOT of coffee, as you would expect. As the only person in my house who consumes coffee, I find myself regularly making t 2 twelve cup pots per day. In the winter when the weather is especially bitter there may be a 3rd. In the summer months I may not finish the 2nd pot, where I then make coffee ice cubes for simple iced coffee (recipe HERE). When I travel, I drink the coffee of wherever I am and, since I do a fair amount of traveling, have had coffee in lots of places. My overall opinion is that Americans drink weak coffee. First, let me say that ‘great’ coffee is like ‘great’ wine. Like what you drink and drink what you like. With that being said, here is a simle checklist to get you started on making great coffee. STEP 1: FRESH BEANS- Buy beans from a source that ensures freshness. Coffee goes stale in a matter of weeks, leaving it bitter, lacking body, aroma, and sweetness. Like any baked good, the clock starts ticking from the time it comes out of the roaster. (If you’re one of those people who found this great coffee in 1996 and bought a bunch hoping to use it for special occasions, throw it away.) 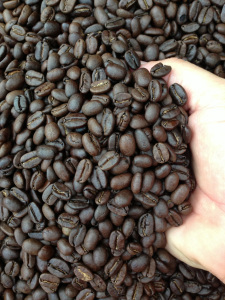 Ironically, most coffee is ‘Freshness Dated’ a YEAR from roasting, so don’t trust the dates. Find a source that offers a ‘roasted on’ date. Coffee isn’t just for drinking hot in the morning! It can also be used in a variety of other ways. Check back often for many sweet and savory uses for coffee.